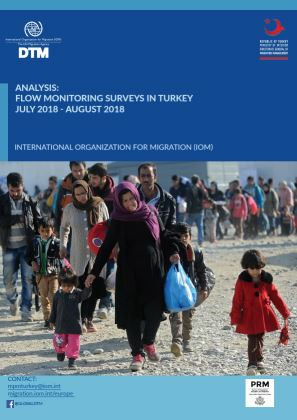 Migrants Presence Monitoring (MPM) team in Turkey conducted 3,043 surveys with Afghan, Iranian, Syrian and Iraqi nationals between July and August 2018. 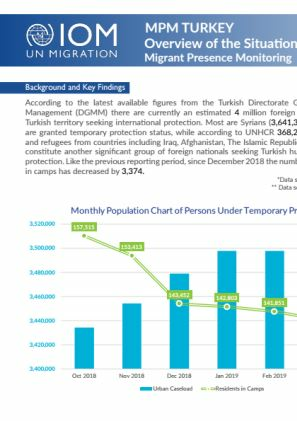 More than half of the respondents from Afghanistan, the Islamic Republic of Iran and Syrian Arab Republic were adult males, while 53% of respondents from Iraq were adult females. Over half of all respondents reported they were married. 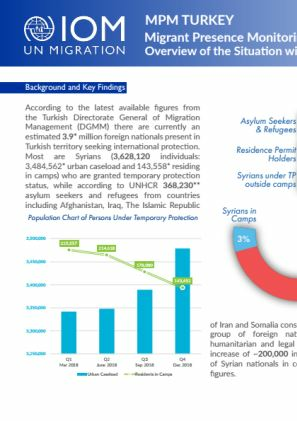 The majority of respondents from the Syrian Arab Republic (96%) reported Turkey as their intended destination at the time of departure from their coutnry of departure or habitual residence, followed by respondents from Iraq (85%) and Afghanistan (75%). The lowest share was among nationals of the Islamic Republic of Iran (22%). 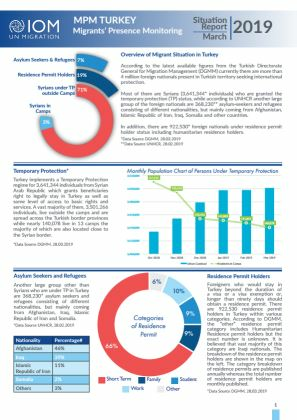 Additionally, the share of respondents who reported Turkey as the intended destination country at the time of the itnerview decreased among the respondents of all nationalities.